Are you in need of sheltered parking for your vehicle, but hesitant about the cost? Look no further. Steel garage kits offer an attractive and functional addition to your home, at an even more attractive price tag with prices starting at just $7,500 for a single car garage. Hiring a builder can be costly, but a ready-to-assemble steel garage kit is the perfect solution to homeowners on a budget. 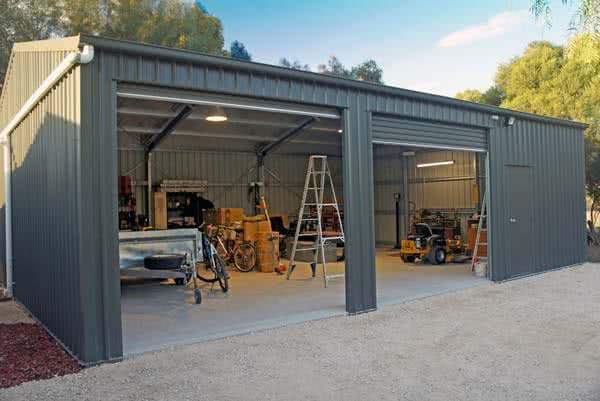 Assembling a metal garage allows you to not only build a high-quality structure at a low-cost, but it can be an unbelievably rewarding experience for do-it-yourselfers of every skill set. Garage kit buildings provided by our suppliers offer you the opportunity to practice a variety of skills, from pouring a concrete foundation to framing and erecting walls, to hanging soffits and fascia. Once erected, you can stand back and take pride in your accomplishment every time you park your vehicle. Building on the exceptional structural integrity of our prefab metal buildings, self-build steel garage kits can be customized with a myriad of exterior finishes. From siding to brick, masonry or stucco, the exterior appearance of your garage can either extend and complement the architecture and style of your house, or can take on a unique and individual aesthetic to act as a “conversation piece” alongside your home. Whichever route you decide to take, the options are limitless with a DIY steel garage kit. While many people will choose a DIY garage kit for the protection and shelter it promises for their vehicles, there’s no reason why that covered parking spot can’t be transformed into a relaxing retreat, exciting entertainment and gaming area, a woodworking shop or even a moving screening room. A starting off point for any number of end uses, placing an order for a steel garage kit is the first step in sparking some creativity. A Quonset hut building has a rounded corrugated arched roof, known for its incredible strength and resilience. The roofing style was developed during World War II, when the U.S. Navy required a lightweight building to protect their troops that could be easily shipped and assembled in Europe. The strength of the Quonset building’s corrugated roof proved to offer exceptional safety during bomb raids during the war. That same resilience translates against earthquakes and hurricanes. For homeowners living in regions prone to extreme weather, the Quonset style offers the highest quality in strength and sturdiness for your vehicle. Starting at $5 per square foot, the Quonset-style garage kit can cost up to 30 percent less than a peaked roof garage kit. A peaked roof style garage is the most traditional building design and is sure to complement the appearance of most homes. Built from high-quality pre-engineered metal components, a peaked roof garage offers excellent strength and rigidity in a design that is stronger than most other construction materials. Starting at $7 per square foot, a peaked roof garage kit is an affordable project for any do-it-yourselfer to take on. Before assembling a steel garage kit, always check first which building permits must be obtained from your local urban planning office or town hall. You will need blueprint plans of your garage, available from your steel garage kit’s respective manufacturer. A registered third party must certify the plan, and a building inspector will review your proposed construction. Typical issues a building inspector looks for include electrical wiring, the durability of the roof for the climate in which you are living, earthquake safety, and structural elements of the building. There will be rules regarding how close to the property line you will be able to construct a garage. Larger garages tend to have more stringent building regulations. Whether you decide to build an attached or detached garage, there are both advantages and disadvantages to both styles. An attached garage allows homeowners to avoid walking outside in inclement weather and can be built near a kitchen to allow for efficient transportation of groceries from your vehicle directly to the pantry. However, depending on where the garage is built on the property, it could potentially obstruct a window and result in a loss of light on one side of the home. Generally speaking, most houses look better without an attached garage. A detached garage allows light to enter the house for all four sides and tends to offer more space inside for multiple vehicles, a workshop, studio, home office or even guesthouse. 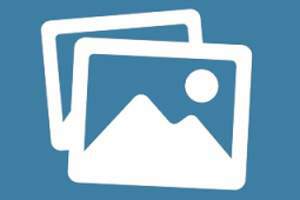 A third option is a partially attached-detached garage, which offers the best of both worlds. This style of garage is mostly detached, with an attachment to the house in the form of a breezeway. The advantage of this type of garage is that the breezeway can easily be transformed into a mudroom, offering more storage space and a separate area in which to leave mucky shoes or wet raincoats. Why Steel for DIY Garages? Quick and Easy Assembly: Do-It-Yourself Kit makes assembly quick and easy. In just a few weekends, with the help of a few friends or family members, your garage kit will be a fully assembled and fully functional enclosed parking spot for your vehicle. Cost Savings: An economical alternative to hiring a contractor, a DIY kit will save you money on labor. By choosing steel, a low-cost alternative to lumber, you can expect to save up to 60% on materials. 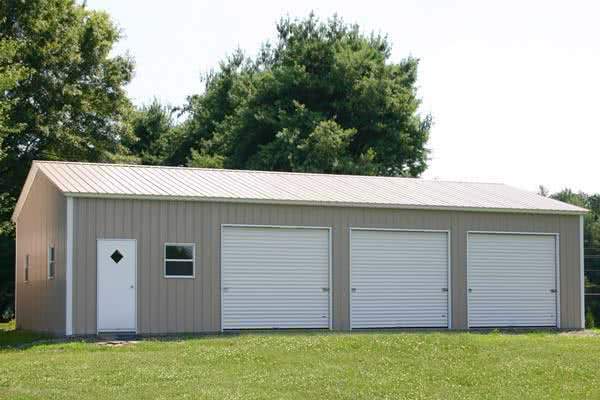 A metal garage is also highly resistant to decay, mildew, and rust due to its zinc and an aluminum alloy coating, and will result in lower maintenance costs over time. Steel’s fireproof qualities also ensure you will see lower insurance premiums, saving you even more money down the line. Durability: Termite, rot, and mold-resistant, steel is also non-combustible and will require little in the way of maintenance. Enjoy seeing your garage building lasting for generations to come with little to no repairs. Protection: The stable interior climate provided by a prefab garage also increases the lifespan of your vehicle and protects against rust and corrosion of the exterior finish, and mold growth on the interior. Your stored goods and vehicles will be well protected in a metal garage. Strength: Steel has an incredibly high strength to weight ratio, and is one the strongest and most durable construction materials on the market. Strong enough to withstand hurricanes, gale-force winds, and even tornadoes, a kit garage provides first-rate protection against harsh weather and damaging sun rays. 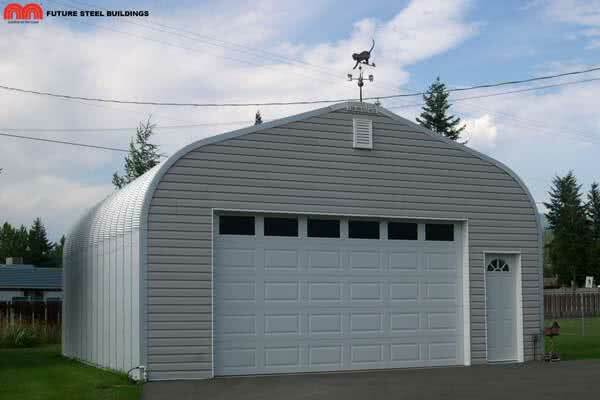 With a metal garage, you can rest assured knowing your vehicle is in the best shelter available. Green: Steel is one of the most environmentally friendly alternatives to timber on the construction market. As a 100 percent recyclable material, most manufactured steel today also contains an average of 25 percent recycled content. Keep landfills free of construction materials and reduce your carbon footprint by choosing steel for your garage kit. Build bigger to maximize free interior space, without blowing your budget. With the savings you will make by constructing your own garage building you will be able to go bigger. Steel building kits are a smart choice when it comes to protecting your vehicles and other valuable toys. Store items out of the house. One car… two or three?… or maybe you just want to add more space for tinkering. Whatever the reason, making a garage more spacious is as easy as… adding on. No moving stuff or storing it while you build on additional space. Simply bolt the new space on. It’s the perfect economical choice for the do-it-yourselfer. The fact is a metal garage kit for your valuable vehicles is an intelligent, economical choice – and they’re fireproof.